Life lessons. We learn them through love, through fear, and everything in between. Pain has always been my biggest teacher, and I’m sure you can relate. Sometimes we learn our lessons immediately. Sometimes we think we’ve learned the lesson only to keep replaying the same old negative patterns over and over. And sometimes they literally have to slap us in the face, knock us down, and step all over us before we really get it. The lessons we learn in those incredibly bare emotional times are the ones that we will never forget. But fortunately, we can also learn lessons through those who have been down those bumpy dirt roads for us. 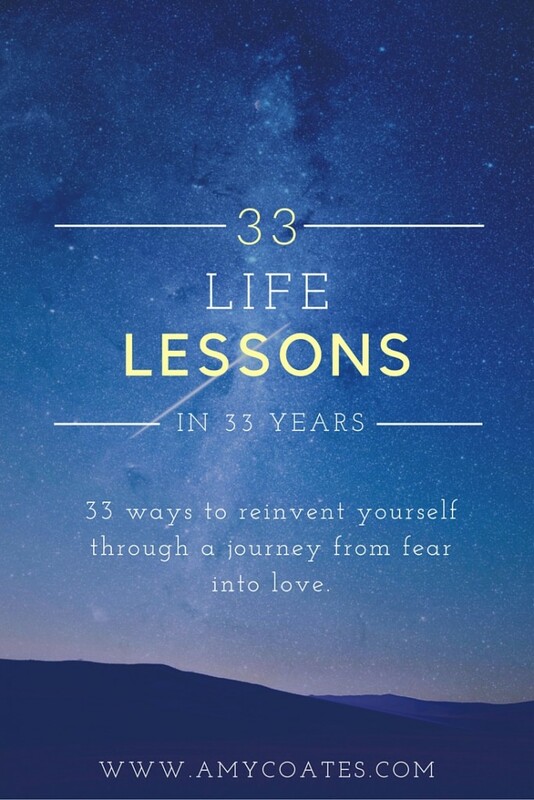 In honour of my 33rd birthday this week, it is my hope that my life lessons can shine some light on your burdens and allow some grace to enter your life without you having to learn them the hard way. It is safe for you to open your heart to give and receive love. The more you love the more love can return to you. Release any fears you have around giving and receiving love. Choose to find the joy in every moment. Even in the chaos. Especially in the chaos. Any time you find yourself unhappy just let it go and do whatever you must in order to return to happiness. Do you want to be happy? Happiness is the only choice for an outstanding life. When we take action and think thoughts that bring us pleasure, we are in alignment with our inner being. High vibrational beings attract other high vibrational beings; Happy people want to be around happy people! We are all on a journey. We are in no position to judge another because we have not walked in their shoes. They have their own reality that is separate from ours. So let judgments leave as quickly as they enter your mind and replace any unloving thoughts with loving-kindness. Send them love and light and wish them well on their travels. Life is what you make it. Decide what you want to get out of life. Choose your destination and take guided action to bring it into tangible reality. With each moment of decision, you have the power to shape your destiny. Set goals. Review them daily. Check in regularly to make sure your actions are producing the desired results and change your actions as required. Start a savings account and put money in every time you receive a paycheque. This is something we have started with our children from the day they were born and they’ve already amassed small fortunes. It is so exciting to be able to empower our children and teach them to respect money. And it’s never too late to start. If you don’t have a savings account, start one today! Let go of past wounds. Let go of all things you cannot control and know that everything always works out in the best interest of everyone involved. Life is too short to hold a grudge. Resentment is like consuming poison and expecting the other person to die. Choose happiness. Choose forgiveness. Choose love. Forgiveness does not condone others’ behaviour, but it does return your power to you. In forgiveness, you let others off the hook for your happiness. Forgive, let go, and move on. Wake up every day and proclaim, “Something amazing is going to happen today!” Expect surprises. When you expect life to be really good, life will show you the really good stuff. If you expect life to be hard, it will be. The tough times = exponential growth. We are always in a constant state of change. Even if you are at rock bottom today, a year from now this tough time will be long behind you and you will more clearly see the lessons. Time heals. Draw upon your energy and strength and follow your inner guidance which is always steering you toward joyful expansion. You are never alone. You are always being guided and protected. This too shall pass. The easiest way to get yourself out of a rut is to return to love and gratitude. Find appreciation in every moment and you will bring yourself into alignment with your inner being. Practice gratitude and your life will flow beautifully before your eyes. 10. The Universe returns the vibration you emit. The law of attraction is real. The Universe rewards high vibrations with high vibrational gifts and low vibrations with low vibrational gifts. If you are kind, you will receive kindness. If you are fearful you will encounter more and more fear. Be aware of the vibration you are emitting in each moment and bring yourself back into alignment as soon as you become aware of your misalignment! 11. Baby steps equal massive action. If you take small courageous actions every day toward the realization of your dreams, you will be successful in achieving them. Small courageous action = massive change! 12. Get rid of negativity. Get rid of anything and anyone in your life that brings you down. This includes all letters, pictures, paintings, clothing and items that give you a bad vibe. Turn off the radio when songs don’t make you feel as good as you want to feel. You will mimic the vibe of your tribe, so make sure the people you hang around most often are lifting you up. You want to surround yourself with people who help you learn and grow. If you’re the smartest person in the room, you’re in the wrong room. 13. Move your body daily. Cash in on all the health benefits of exercise and increase your heart rate every single day. Not only will you burn calories and build muscle, but you will release endorphins that will raise your mood naturally. Exercise literally makes you happy, not to mention healthy! 14. Don’t be too serious. People who laugh more are less stressed. Laughter boosts the immune system and releases endorphins just like exercise. When you are happy you raise your vibration. When you are high vibrational, you attract good feeling experiences into your life! Your angels and guides are available to help you in each and every moment, but you have been given the gift of free will so you must ask them for help. Ask them for the strength and power to forgive. Ask them for courage and clarity in troubling times. Ask them to come to you in your dreams and help you work on a specific problem. Ask them to open your heart and help you to love freely. Ask them to help you see things differently. Ask them for guidance on anything and everything. Instead of complaining about anything, ask that the solution be shown to you. Ask for guidance and look for the answers all around you. 16. Find a role model. Search out the best people in your field and learn from them. Find people who are already doing what you want to do, and doing it well. They can save you from making a lot of mistakes, and wasting a lot of time. 17. Don’t take anything personally. Don’t let the things that people do or say bother you. Their opinion may be their reality but it has no business becoming yours, especially if their opinions make you feel badly about yourself! Your true self is pure love and anything other than pure love does not really exist. 18. Use your power wisely. You can focus your attention on anything. What you repeatedly focus your attention on is what you are going to amass skill in. Invest your time and energy wisely. For instance, what do you see when you look at your partner? Do you see all of the things that bother you or do you see all of the reasons why you love them? See only love. Be loving. Do these two things and your relationships – and your life – will transform. 19. You are not your thoughts. That continuous chatter that occurs between your ears all day long is not who you really are. You are the watcher of the thoughts, but the thoughts are not you. Let thoughts move freely through your brain and be careful not to attach yourself to them. Notice the thoughts and release them. Your inner being cannot be disturbed so long as you are mindful of this. Do not take even your own thoughts personally. 20. Stop all self betrayal. Listen to your emotional guidance/intuition/vibes/gut feelings and be true to yourself; be true to your emotions. Emotions provide deep insight into the soul. When something feels bad, it probably is. If you become aware that you feel poorly, find a better feeling thought or take a better feeling action. Express your emotions. Unexpressed emotions are ticking time bombs, so communicate your emotions to your tribe as they arise and let them move through you. Work through and release pain as it arises. If you are holding on to anything, there is no better time than the present to let it go and give yourself permission to heal. 21. Procrastination is a silent killer. Perfection and procrastination team up to kill your dreams. If you have a dream, don’t wait until conditions are perfect before you begin making it a reality. Perfection doesn’t exist, so you’ll be procrastinating forever! Whatever it is, do it now! You can stumble, pause, and retreat for years on your dreams even, and as long as you get back up and move forward you will never fail. Learn from your mistakes. Use the lessons to build yourself up and make yourself stronger. Every impediment means that you are closer to your goal. Never give up. It is never the past. It is never the future. It is only ever the present, and it’s the most beautiful gift you will ever receive. The present moment is where we experience pure love and joy. Don’t get caught up reliving past traumas or spend your present moment worrying about the future. If you can’t control something, like the past for instance, let it go. Use your senses and enjoy the present moment. Be still and enjoy spending time with yourself. Enjoy time with others. The most important person in your life is the one that is right in front of you in the present moment. Give your all to them. 24. Fear is an illusion. We are the creators of our reality. We are the creators of our fears. Our fears exist only in our mind and they are not real. A fear of public speaking, a fear of spiders, a fear of not being loved, etc., they are all illusions. As soon as you make the decision to change your beliefs around your fears, the illusion is unmasked. Shine a light on your fears. Fear thrives in the darkness, but the moment you shine a light on it, it can no longer survive. Decide that you are an amazing public speaker. Spiders are a beautiful piece of nature. Know that you are infinitely loved and supported by the Universe. Take your power back and start believing in the magnificent being that you are and destroy those illusions! 25. Only love is real. If fear is the darkness, love is the light. You can feel ecstatic love whenever you wish. Tap into the immense field of love that is all around. God is love. You are love. See through the eyes of the Divine, the lens of love, and your life will change forever. Continuously let go of any disserving thoughts and return to love. Look past the egos of others and see the love within them. See love and the darkness will diminish. The more often you choose love over fear the easier it will get and the happier you will be. Take time to meditate every day. An ideal time is 20 minutes for beginners. This will give you enough time to really relax and just be. This is where you can truly connect to divine love and grace and be one with your inner being. There are many benefits of meditation such as an increase in focus, optimism, immunity and awareness, and a decrease in depression, worry, stress, anxiety, and fear. It is basically the happy pill everyone is looking for, so if you don’t meditate now I encourage you to give it a try! Be yourself. Speak your truth and shine your light. If you show up authentically in your life, you give others the permission to show up authentically as well. Let your true self shine and give any worries about doing so to your angels. You are loved and supported by the Universe at all times. The more often you act from your authentic core, the more space you open up for magical opportunities to enter into your perception. 27. Be kind to yourself. The people you spend the most time with have the opportunity to shape your thoughts and your beliefs. Since you have to hang out with yourself a whole lot, you had better watch what you say to yourself on a consistent basis. If you were another person, would you want to hang out with you? What would you want your best friend to say to you? Start being your best friend. Take care of yourself, love yourself, say nice things, and enjoy spending time alone. You should be your biggest raving fan. If you don’t believe in yourself then no one else will. You have to love yourself first. You don’t have to eat a rigid diet, and you don’t need to label yourself. You can eat primarily paleo diet but have ice cream on occasion if you really enjoy it. Be authentic in all areas of your life. If you are binging on unhealthy foods, get to the root of the problem by shining a light on it. Love yourself enough to eat well. 29. Your thoughts create your reality. The thoughts you think on a consistent basis shape your beliefs and form your actions. Be kind with your thoughts and suspend all judgment as it arises. All material objects came into being from a thought someone had. Each thought is a prayer that is immediately sent out into the Universe, so think wisely. This goes for people too. When you think poorly of someone, they can feel it whether you vocalize it or not. Think the best of people, and they will feel that as well! The cycle of giving and receiving is one of ebb and flow. Give every day without expectation, and be open to receiving the blessings the Universe has to offer. If you enjoy giving but resist the presents that others try to bestow upon you, you are disrupting the cycle. Receive graciously so that others may enjoy giving. Give, accept, and repeat. Follow your bliss. If you consistently take actions that make you happy, you are living with passion. To live with passion is to greet each day with excitement. If you are not excited about life, then you need to start asking yourself when you really come alive. When are you most you? What lights you up? When do you have the most fun? Start doing more of it! 32. You’re growing or you’re dying. Learn about something that interests you and share what you have learned with others. When we are learning, creating, and teaching, our spirits thrive. 33. We are all one. Everything is connected. We are all energy and energy knows no boundaries. We have the power to change another’s mood by the vibe we’re putting out. We can telepathically connect with people on the other side of the world just by thinking about them. How many times have you thought about someone and then they coincidentally called you out of the blue? There are no coincidences. We are all made of the same loving fabric. When you love others you are loving yourself, and when you find fault in others you are finding fault in yourself. Love unconditionally. The colour of our skin means nothing. Our socioeconomic backgrounds mean nothing. We are all in need of great love and support. Treat others as if they’re on your team, because they are.